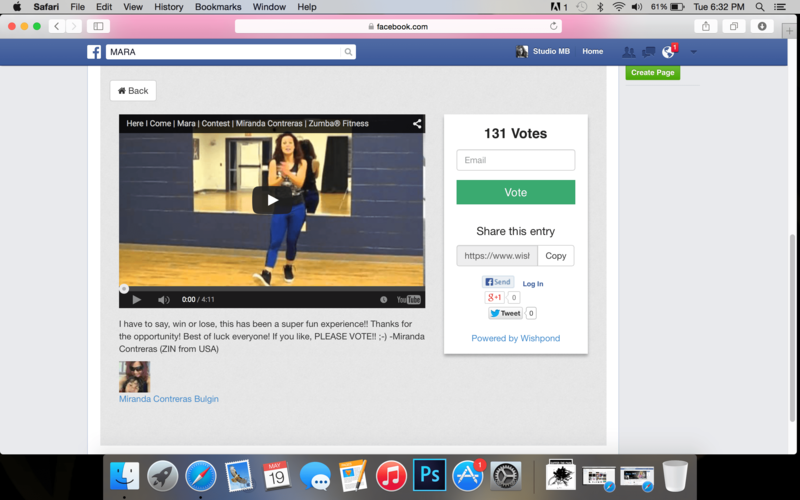 Initially I wasn’t going to do it, but after hearing the song, I thought “why not?” I decided to film my choreography and submit it in a chance to win an all expenses paid trip to Miami to be in a Zumba® music video! The great part about it is that all top 10 finalists get invited to be in the video, so even coming in 10th place is still a big win!! Have a chance to represent little ‘ol Atchison in a BIG way?! HECK YEAH! I need your help!!! To make it in the top 10 I need as many votes as possible!! All you have to do is clink the link below, and click vote! Occasionally users get asked to enter their email and/or to validate their identity through Facebook. Note: They DO NOT use any of your personal information or send annoying spam (to you, or on “your behalf”). They only see your public information (that they could search for in Facebook or on Google). This is to make sure that people aren’t cheating with multiple votes. SO! No worries! Please take a minute to hit vote and tell your family and friends!! Help me represent the midwest in this awesome contest, and show the world how we rock it out!!! Thanks a million! !